Central Bucks Lightning Lacrosse - 100% THE ONLY WAY TO PLAY! OUT HUSTLE, OUT WORK, OUT THINK, OUT PLAY AND OUT LAST. Registration is now open for Bucks Select's Summer Camp. This year, grades 1st - 8th will be able to attend the camp. Spots will be limited - so register early. This camp is open to all players, regardless of team affiliation. Please contact Leslie Sharman ( ) at Bucks Select for more info, or visit http://www.bucksselect.com for more info. 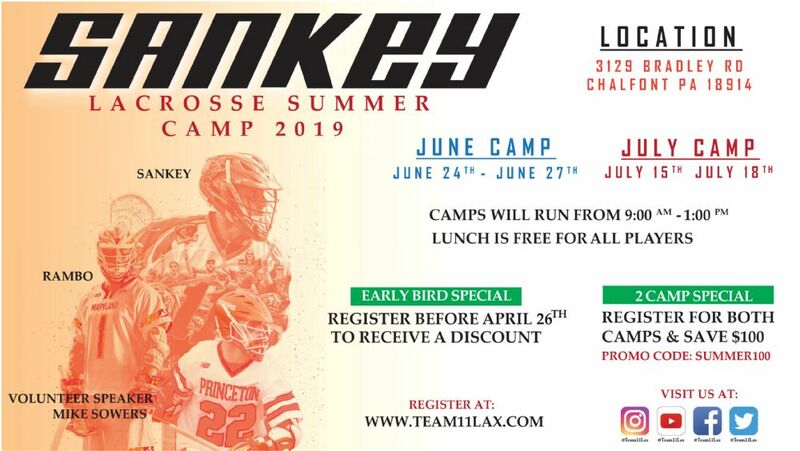 Team 11 / Sankey Lacrosse Summer Camp Dates! 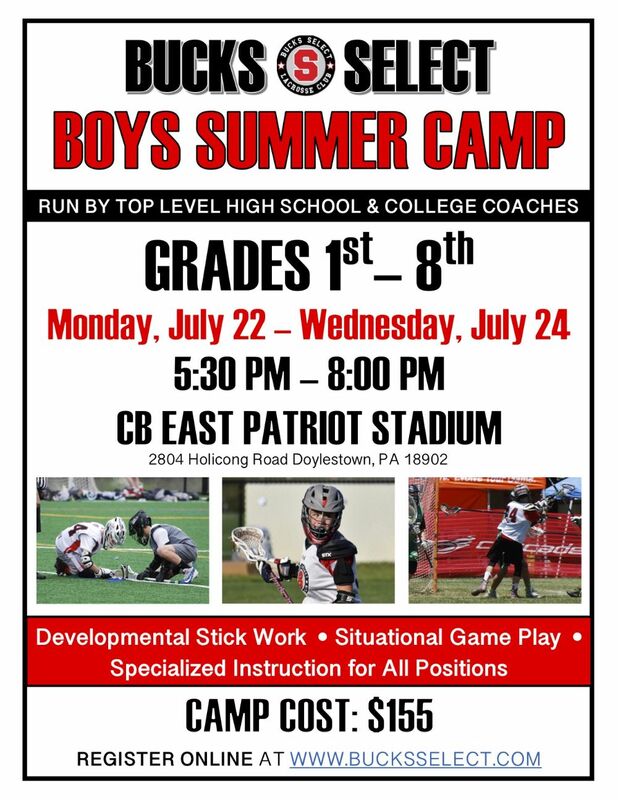 Sankey Lacrosse Camp will return to Bucks County for the 4th year in a row but with TWO sessions this summer! This unique lacrosse camp experience offers players positional training by some of the best players and coaches in the game. Spend the first two hours with your position coach learning the fundamental keys to succeed in your position, and then incorporate those skills into live competition! Free pinnie and lunch provided to all players with tons of Maverik Giveaways everyday at the end of camp each day! The coaching staff includes players such as Joey Sankey (PLL Redwoods, UNC All-Time Points Leader), John Moderski (PLL Chrome, Villanova Defenseman), and guest coaches/speakers such as Matt Rambo (PLL Whipsnakes, Philadelphia Wings, Tweaarton Winner at Maryland) and Michael Sowers (Princeton All-American). The camp will run from 9:00-1:00pm Monday through Thursday. First session will be June 24-27 and second session will be July 15-18. Take advantage of discounts by registering early or for both sessions! You will receive a $35 discount if you register before April 26th and receive a $100 discount if you register for BOTH sessions by using promo code "Summer100" (must register for both weeks to get the $100 discount). Include a statement confirming that they wish to play for CBAA Lacrosse because their home school district does not have a youth program. Identify if the player is a first year player - if they are an experienced player, provide the name of the program they participated in the prior spring. Any player who resides within another team boundary, and wishes to play for the CBAA, must go through the SEPYLA waiver process BEFORE registering with CBAA. An e-mail needs to be sent to Steve Lehman, chairman of the SEPYLA competition committee, explaining the hardship and reason for the request to play for the CBAA. There is a $25 fee for the waiver process, payable to SEPYLA. PLEASE BE ADVISED THAT SEPYLA WILL ONLY GRANT WAIVERS FOR EXTREME HARDSHIP CASES - NOT JUST BECAUSE YOU WANT TO CHANGE PROGRAMS. As a reminder our territory includes all feeder schools to CB East, CB West and Palisades. If your physical address does not reside in these boundaries, you need to obtain a waiver OR register with your home program. No exceptions! !